This issue sees Batman, Superman, Batgirl (Carrie Kelley), Lara the Supergirl, and the other heroes have their final confrontation with Quar and the Kryptonian invaders. Afterward, the Dark Knight Universe has a new status quo. Especially now that Bruce Wayne has been revitalized via the Lazarus Pit. So where do our heroes go from here? Let’s start with the positives. This issue, and the DKIII main story overall, were really well illustrated. Andy Kubert has been able to meld his style with just enough vintage Frank Miller to make this a unique presentation. Even Miller himself, when working on the mini-comics we got in each issue, was able to settle into a groove. His art has been widely derided in recent years. But while he started off shoddily, it’s been quite awhile since I’ve enjoyed his art this much. Ray Palmer/The Atom has a really nice moment in this issue where he gets to thwart some of the bad guys. It was clever the way they incorporated Ray into all of this. So to see him “get his win back” in the end was cool. I also liked what they did with Green Lantern. A little corny? Yes. But he had a great little sub-plot about defeat and redemption. 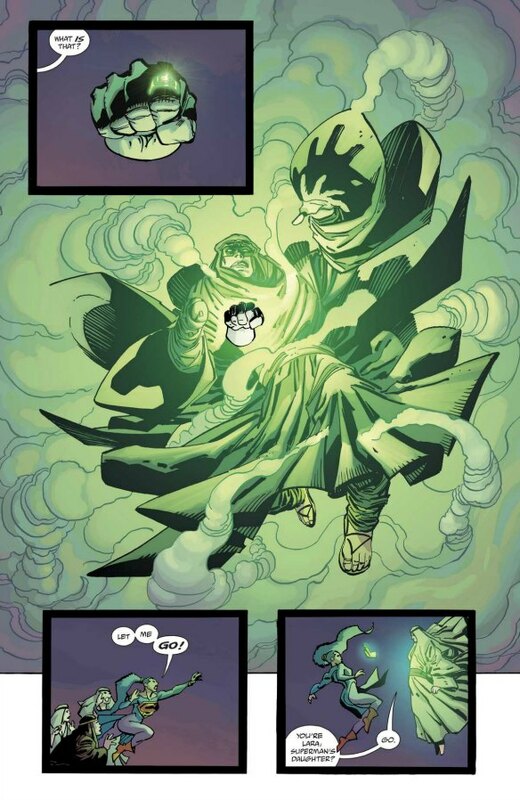 And when you consider one of Green Lantern’s original creators, Martin Nodell, took inspiration from Aladdin and the magic lamp, it makes a kind of sense. Maybe the reason I’m so into this new take on Green Lantern is because when you close DKIII, it’s one of the few things left that’s really and truly different about this universe. Yes, certain supporting characters are absent. And we’ve got Lara and Carrie in the picture, along with Clark and Diana’s young son. But think about it. We don’t even have that old, gritty, Clint Eastwood-style Batman anymore, now that Bruce has gone through the Lazarus Pit. The Justice League is essentially back together now. What’s left to do in this universe now? Various points in this story felt like we were gearing up for a passing of the torch. 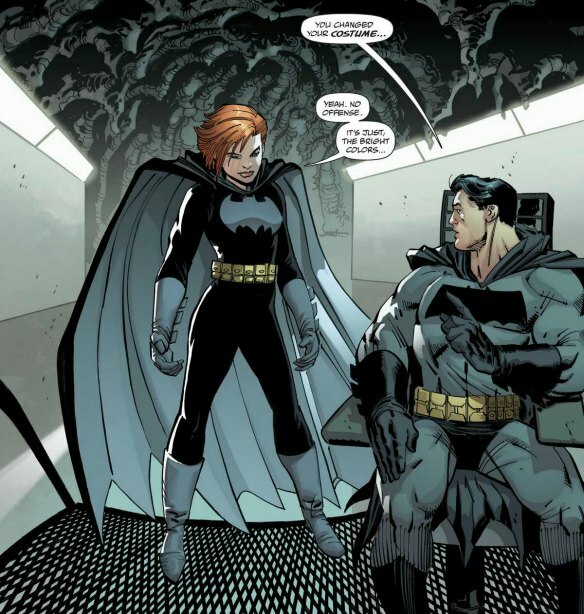 Carrie Kelley becomes Gotham’s protector, while Lara takes over for her Superman. In the end, they pay that off with Carrie becoming Batwoman and teaming with Bruce. Then in our mini-comic, we see Lara is now under the tutelage of her father. This feels like they were didn’t want to remove Batman and Superman, for fear of how it would effect sales going forward. I can understand that. But the ending of this story feels so safe and sub-par anyway, that they may have made that sacrifice regardless. So why not just go for it? Why not kill the Bruce Wayne character? The Joker had an iconic death scene in The Dark Knight Returns. You can take a crack at doing the same thing with Bruce here. Given how old he is, it’s getting more and more contrived to have him keep coming back in the Batsuit. So have him die in Superman’s arms in issue #6 or #7, prompting Carrie to officially take over for him as Batwoman. There’s an argument to be made for that being the ending DKR should have had. Then, if you must bring Bruce back via the Lazarus Pit, have it be in DKIV. We can see him challenge Carrie for Gotham City, the effects of the pit having driven him insane. Many a reader, myself included, has criticized Frank Miller for the bizarre and even offensive choices he made in The Dark Knight Strikes Again and All-Star Batman and Robin. But I’ll always credit Miller with being willing to take risks with his art. In the end, DKIII feels like they went too far in the other direction. The Dark Knight Returns has become a timeless piece of art. DKIII seems mostly like something thrown together by editors so that DC can continue to cash in on the team of Frank Miller and Batman. It’s a missed opportunity. With Brian Azzarello, Andy Kubert, and all these other supremely talented creators on board, they could have made something that allowed DC to sell more books, Instead we got something that feels largely hollow. 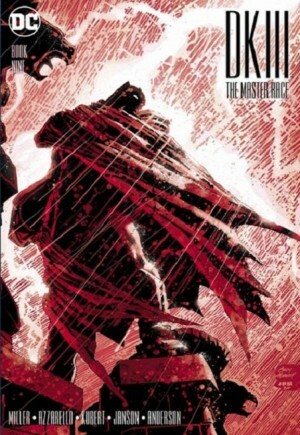 This entry was posted in Comic Books/Graphic Novels and tagged Andy Kubert, Batman comics, Batwoman, Brian Azzarello, Bruce Wayne, Carrie Kelley, comic book reviews, comic books, Dark Knight III: The Master Race, Dark Knight III: The Master Race #9, Dark Knight Universe Presents: Action Comics #1, DC Comics, DKIII, event comics, Frank Miller, Frank Miller Batman, Green Lantern, Hal Jordan, Lara The Supergirl, Lazarus Pit, Ray Palmer, Rob Siebert, single issue reviews, Superman, The Atom, The Dark Knight Returns on 06/12/2017 by primaryignition.